This week’s Sunday Supper theme is citrus recipes! Today I’m sharing one of my favorite stir fry recipes that is easy and full of flavor. Combine green onions through brown sugar for sauce and set aside. In a large frying pan, over medium heat, using the oil, cook the chicken until mostly done. Add the onions, bok choy and peppers and cook until softened. Add the sauce and simmer just a few minutes. Serve over brown rice or couscous and garnish with the basil. The Verdict: It was super basil-y, definitely not bland! I loved it. DH likened it to an IPA–the first few sips are a bit overpowering, but then it mellows out. 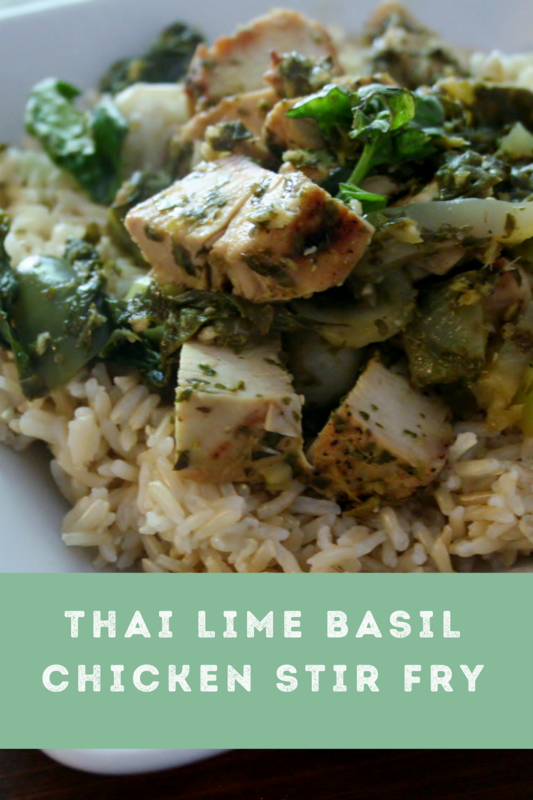 I loved the flavor of the lime basil but next time I won’t add additional basil to the sauce. these flavors sound perfect. I love Thai food but don’t make it very often. Bookmarking this to try soon. Oh my yumminess! So many of my favorite flavors! Love all the fresh ingredients. Looks like a fabulous recipe. Thanks for sharing! I love stir frys! Especially ones that include basil and lime. I love stir-fry’s with lots of flavor, love everything about this! I am always happy when a cook gives final thoughts as you did with your “verdict”. Thanks for sharing. This dish has so many of my all-time favorite ingredients; lime, basil, fish sauce. Perfect.